Complimentary valet parking when dining. Jazz Duo on Friday and Saturday evenings and pianist during Sunday Brunch from 11am-2pm. Happy Hour Specials Sunday thru Friday from 4 to 7 p.m. Enjoy $6 Bar Bites, $5 Daily Shrimp Specials and $4 Cocktails, House Wine and Domestic Beer at the bar. Our Shrimp Special change daily and includes Shrimp Quesadilla, Fire Cracker Shrimp, Jalapeno Stuffed Shrimp and other options. Discounted Bar Bites include Fish Tacos, BBQ Chicken Quesadilla, Pork and Burger Sliders and three Flatbread selections. These specials are available in the bar area only. Galvez Bar & Grill is the go-to restaurant for local seafood as well as cocktails. 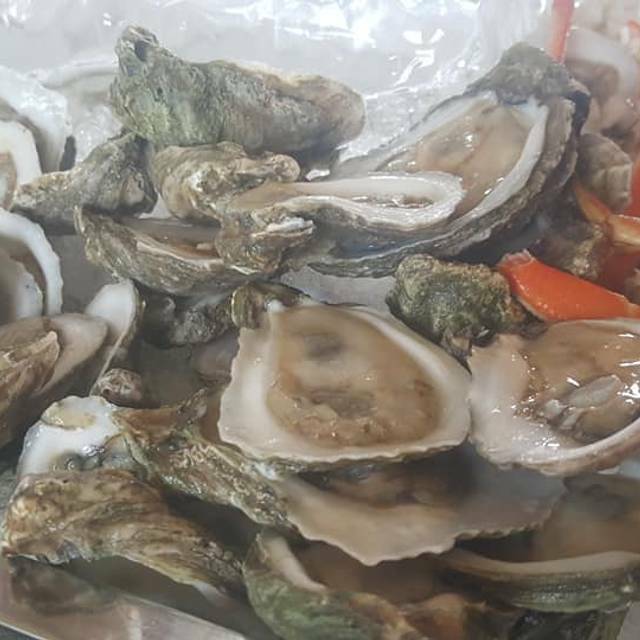 Galvez Bar & Grill features fresh seafood from Galveston’s Pier 19, steak, Po Boys, award-winning Gumbo, salads and a variety of bar bites including filet mignon sliders and flatbread pizzas. Its Sunday Champagne Brunch (served 11am-2pm) is a top choice for Open Table users and was named as one of the top 100 brunch restaurants in the U.S.
Ancho peppers, honey glazed grilled Redfish, pickled jalapeno, crispy vegetables and lime wrapped in a flour tortilla. We proudly offer the freshest fish available. These items were caught today, cleaned today and cooked today. All can be prepared simply grilled, broiled or blackened. Great Additions: $5 each Fresh fruit relish, Sauteed scampi style shrimp, Avocado pico de gallo, Lump crab in white wine cream. 12 jumbo shrimp, hushpuppies and fries with tartar and cocktail sauces. Available blackened or grilled. Nanette took great care of us! It was super crowded but once we got to our reserved table, it was peaceful. Food was wonderful. All staff was friendly and accommodating. It was a happy birthday. Amazing food and atmosphere! We had a great view of the ocean. Lots of seat. The mimosas were never empty. Food was really delicious. Sunday brunch was amazing, our waiter Greg was attentive and personable. It would the a week of meals to sample everything! Our waiter wasn't treating us right, I had to ask for everything. we sat there for 15 minutes without the waiter bringing us any muffins & butter when I'm looking around & everyone had it but us, had to ask for tea, forgot one my orders & it was my fiance' & I Anniversary.. Bad experience & wasn't happy at all.. This was our first time having Sunday Brunch here. Our experience was beyond amazing. I originally couldn't book a table larger than 4 so after I made my reservation on OT, I called and they were able to accommodate my party of 7. There were 2 toddlers in our group and they were very wonderful about seating us in a section in the back, which we actually preferred. As far as the food selections, there were PLENTY to choose from. Assorted pastries, deconstructed smoked salmon station, seafood bar (shrimp cocktail, raw oysters, crab legs), an array of hot foods (rice, gumbo, fish, chicken, bacon, sausage, veggies + more), an omelet station, pasta station, carving station, and dessert station was in another room. OMG, all the desserts were to die for. Everything was so delicious. And before I forget, bottomless mimosa/champagne. I will ALWAYS do brunch here if I'm ever in Galveston for the weekend. Everything was so good. Not one food item was bland, too salty, too blegh. Try it out guys, you won't regret it! Great food, great music,great prices. This restaurant was perfect to celebrate my wife's bday. Best Sunday brunch! Amazing selection. Presentation is beautiful! 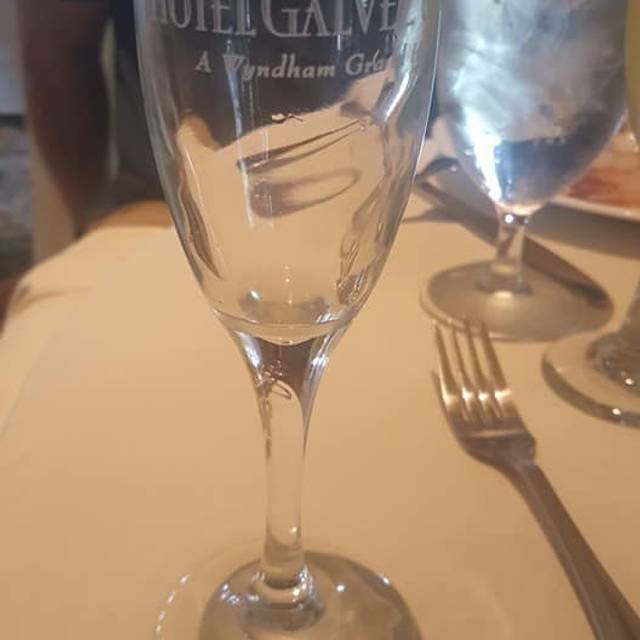 This is our 4 th time eating Hotel Galvez’s Sunday brunch. It is a great experience. All the food is very good. They keep the champagne flowing! Can’t wait to go back! Very nice menu that was quite affordable. Nanette was our server and she couldn’t have been more attentive. Definitely recommend. It’s a great day to meet the girls to have cocktails. But not so much a romantic evening with your husband anymore. It once was a very romantic place, and still is very beautiful, but rather noisy and too bright. Instead of going in the evening like I did, I will go in the afternoon enjoy the sun and have drinks with the girls! The food was delicious. 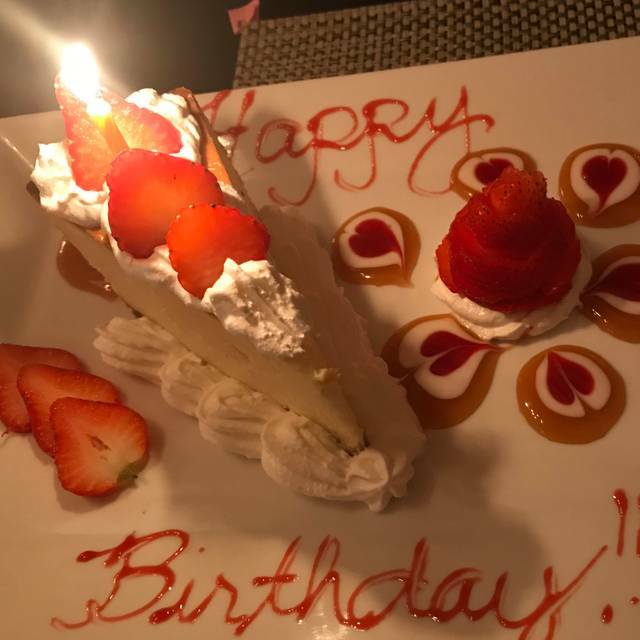 Nannette, our server, made my husband’s birthday dinner extra special with a surprise key lime pie. She also took care of the kids first, so they were fed and happy (and quiet) just in time for our entrees. Service and food were first class! Great lunch special- fish tacos were delicious and followed with bread pudding. There are many conferences in this hotel and the buffet lunch was set up right next to the dining area so was very loud but other than that I have no complaints. I dropped in for the ghost tour of the hotel and thoroughly enjoyed this as well. Wonderful Sunday brunch with friends. Our sever,Lois, was delightful. The food was terrific for Sunday Brunch! A perfect view of the Gulf from nearly every angle!! It was a girls weekend and we had massages afterwards at the Spa which were equally as amazing!! From the service to the ambience, not a thing to complain about! I can't wait to come back in the summertime. Sunday brunch lived up to its reputation. Stellar food choices. Service was good, not great. I will definitely be back. Excellent brunch! So many choices. Everything we ate was wonderful. Ask to be seated in the veranda with the great view. Waddled out of there very happy and full. The Galvez provides a beautiful buffet with endless mimosas. It’s our annual birthday/Mardi Gras treat; well worth the drive from Dallas. We have eaten at the Sunday brunch 4times and have enjoyed it every time. The variety and quality of the food is so good. For a buffet our server Greg was very attentive - cleared the dishes quickly and keep the champagne flowing. We are going back in two weeks! Very beautiful and excellent food. Wish the chairs were more comfortable, but they are nonetheless nice and fashionable. The seats are just too deep so I can't square up making it very my painful for back. Best breakfast omelette ever, and support fresh tasting market fish. Well prepared but no over seasoned. The shrimp cerviche was a real hit. At first the restaurant appears to be a simple, nondescript, typical hotel coffee shop. Even the lights are much too bright. It was raining and cold, so we didn't want to go out. We each ordered the seafood platter without any great expectations. We were amazed at the size and variety of our food when it arrived. It was more than we imagined. However, it was prepared and served perfectly. You could not find better service or a more tasteful meal at any finer restaurant. It turned out to be a perfect dining experience. We highly recommend this great restaurant to the most discriminating customer. excellent buffet with so many choices. lots of fresh seafood like shrimp and snow crab clusters. yummy! meal includes mimosas so that is a great bonus. our server was on top of it and always kept plates cleared and mimosas topped off. ill be back! I almost never eat from a buffet as it is never worth it for the amount I eat. That being said, everything was tasty and the bottomless Mimosa was the perfect mix. The variety was amazing and my sister got her fill of seafood. Last time we went was in 2013. It's was amazing then and still amazing. Loved it!! Lois is so wonderful! Always request her! Gumbo great..oysters not so great. Desserts were amazing!!! Shrimp and mahi mahi delicious. The grill part was good the food was good what wasn't was the bar. Sat at the bar the bartender would either forget or ignore what we ordered. You sit when they finally do serve you a drink they don't ask if you need a menu. If you ask them for a menu it takes them forever to bring you one. The worst bartender by far is the female that works during the day. Ordered a drink got it from her, but later asked for water she never brought out. The other bartender a gentleman in a suit finally came over I think he said we needed something else to drink, he offered and we ordered from him. If she was angry at us for some reason then let us know and we'll go elsewhere, but don't just leave us sit there while you serve everyone else. We enjoyed our overall Valentine Day dinner very much. The food was excellent quality; the service was also top-notch, though I think we had a bit of a new waitress, she was very attentive, and she double checked on things that she didn't immediately know about. This is a highly rated hotel; and the restaurant is very, very nice too. Outstanding as always! 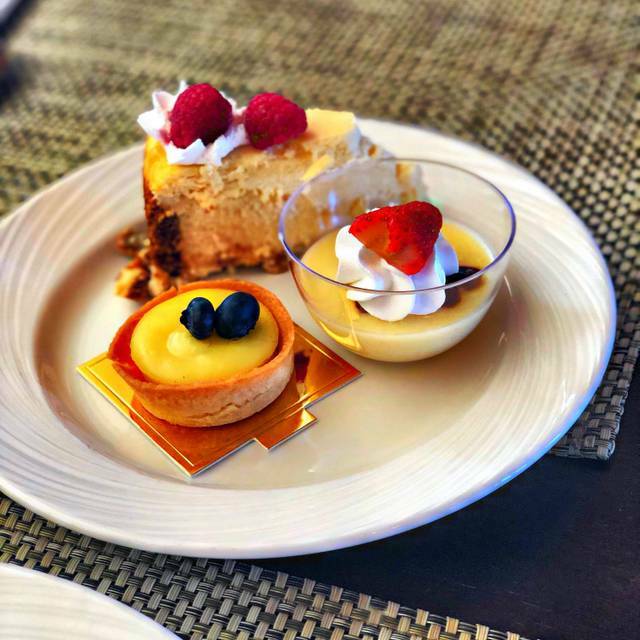 Amazing selection of fresh seafood AND amazing desserts! We loved it! Went with a group of girlfriends. Will definitely be back with family. A bonus is free valet with eating there. 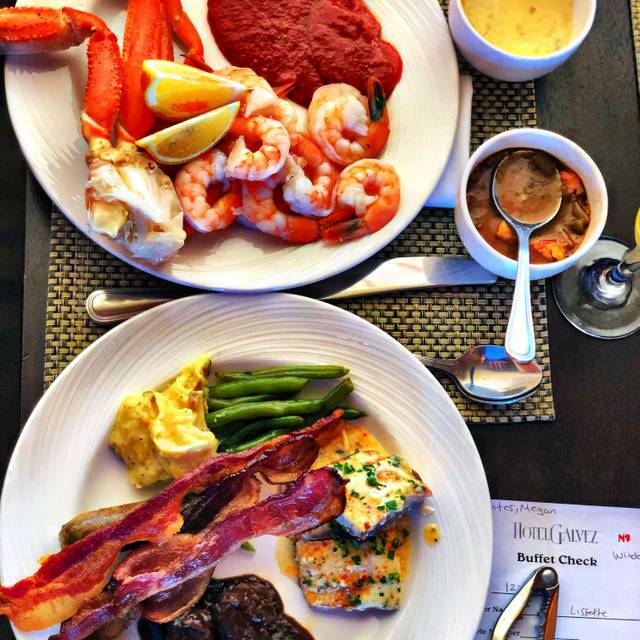 This was the best Brunch Buffett that I have ever eaten at. It was good for my age and also my 2 kids, who are 8 and 9. Excellent variety and quality. 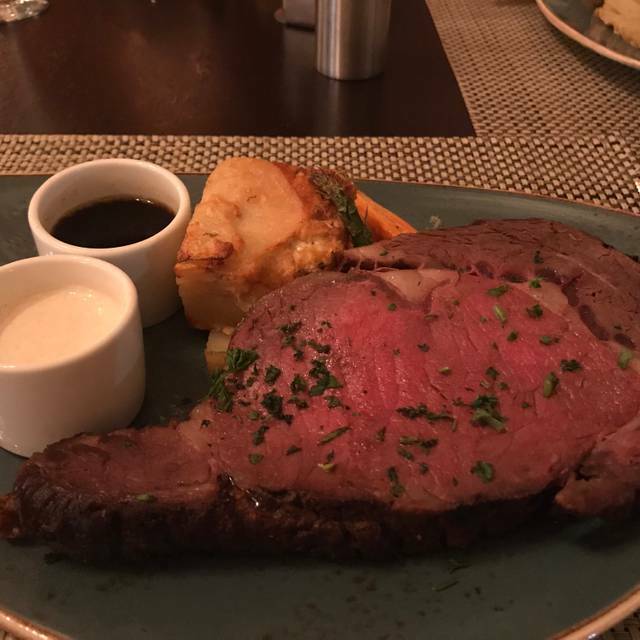 Incredible food, impeccable service! It was amazing how knowledge the wait staff were as well as the bar tender. They all showed how much they loved the restaurant and their positions. Beautiful views with beautifully presented, good-tasting food. We thoroughly enjoyed it! Beautiful. A mix between date night and casual Saturday. I loved it. We will be going back for dinner one night. I took my fiance here for the Sunday brunch for our 3 year anniversary and we loved everything! The food and atmosphere were awesome and the hotel is beautiful. Will definitely be going back! If you are on Galvesto Island on a Sunday and want a special treat, make reservations for this Brunch.